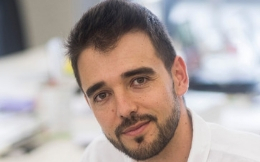 Sergio Ferrer founded his first company when he was 18 and today he leads Linkener, a tech company where they develop technological solutions to help SMEs and industries to become more efficient and competitive. At Linkener they have more than 90 “partners” that distribute their products and services. Creating a network of collaborators and reaching more and more companies is a challenge. He thinks the synergy between companies is the best way to succeed. After all, at Linkener they always say that they connect energies.